Fort Lauderdale Florida Deep Sea fishing charters. Miami, Boca Raton, Hollywood, Pompano Beach Florida, fishing boat charters for Light tackle, inshore and offshore/deep sea sportfishing trips! Fishing charters in and around Ft. Lauderdale, Broward area and all of South Florida. Ft. Lauderdale boat rides, eco tours, sightseeing and boat cruises too! All this and the best fishing boat charter rates in South Florida. We fish like locals do! 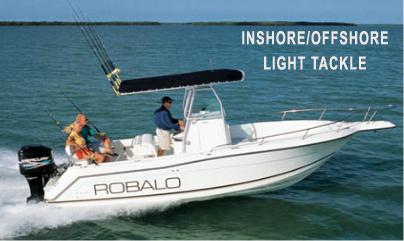 We are Fort Lauderdale's original light tackle fishing charters. Captain Ron has over 38 years fishing experience in South Florida alone. From Miami to Fort Lauderdale, offshore to inshore, his fishing charters will put you onto the fish. Many other fishing operations are trying to provide similar charters in the South Florida area but Captain Ron Mallet is the original light tackle, big game, deep sea and inland fishing charter service in the area. If you want to get on the water to chase big fish or keep busy with more light tackle Florida fishing action then you found the right fishing guide to get you into the best fishing trips on the waters off Port Everglades, Fort Lauderdale in South Florida! From South Beach Miami Florida to Pompano Beach Florida, Ft. Lauderdale is situated close to the blue ocean fishing waters of the gulf stream where the big fish live. Only a short drive from Boca Raton, Hollywood, Delray, Aventura, Dania, Hallandale. Weston or Pompano Beach, Sunrise, Deerfield, you will have easy access to deep sea fishing when heading offshore or inshore fishing with Captain Ron! View all the pages on this website to learn more about fishing in Fort Lauderdale, Florida and what our light tackle inland and deep sea sport fishing charters can offer you. The fishing boat we use is a modern fiberglass boat with a 4 stroke outboard. It is the cleanest fishing boat in town and it is kept in top condition. Our fishing gear provided is also the best you can use. On your fishing trip you will see some great inland sights to and from the fishing grounds. We are the only sportfishing charter in Ft. Lauderdale that is equipped for both inshore inland light tackle fishing and deep sea offshore fishing trips on the same boat, in the same day. We often have families and children fishing with us and they find our fishing trips a perfect fit for kids and family to spend quality time together. Fishing creates memories that last a lifetime. If you are planning to go fishing in the South Florida area anywhere from Boca Raton , Fort Lauderdale, Pompano, Miami Beach, Hollywood, Weston, Dania or Aventura, be sure to look into the rest of the information on this site. There is lots of fishing info that will help to decide if we are the right sportfishing charter service for your day on the water. © RMS INC. 2000-2019 "All rights reserved"